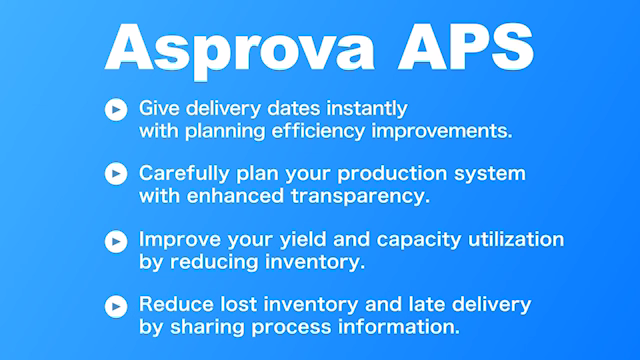 Asprova is an Advanced Planning & Scheduling (APS) system that creates production schedules at high speed for multiple items and multiple processes, fully integrating sales, manufacturing, inventory and purchase plans. Introduction of Asprova (about 14 minutes). For details on the relationships between these benefits, company profit, and Asprova’s features, see the Virtual Cycle of Profit Increase. So many of Japan’s leading manufacturers use Asprova that Asprova has come to be thought of by many as a crystallization of Japan’s manufacturing know-how, hence our motto “Join the WINNERS”. Asprova has received numerous awards both in Japan and internationally. Register as a member to learn more about Asprova.